Call for details. Restrictions may apply. *40% off any order of $1000 or more. 30% off any order of $700 or more. On any complete Closet, Garage or Home Office. Not valid with any other offer. Free installation with any complete unit order of $500 or more. With incoming order, at time of purchase only. 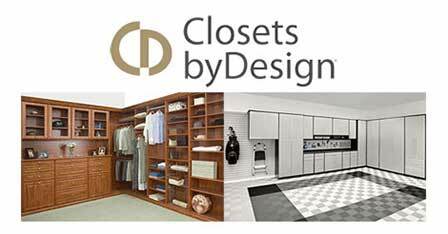 At Closets by Design we work to simplify your life. We build and install custom design closets. But unlike other closet design companies, we also provide custom garage cabinets, home offices, laundries, pantries, wardrobe mirror doors and much more. With a wide selection of finishes, accessories and hardware, you will get the customized look you have always dreamt of. Since 1982, we’ve built a reputation of integrity as the industry leader in customer service and total customer satisfaction. From our no obligation in-home consultation, custom tailored designs and the highest quality product construction, our products simply offer the best value in the industry. Closets by Design understands the necessity of your home office. That’s why we’ve created a line of innovative and effective office systems in a variety of styles and finishes to match your unique needs. Designfloor® is offered in two different types of tile (Traxtile and Flextile), each providing you with a large selection of colors, styles and patterns to make your garage the envy of your neighborhood.